You wake up from a dream of dancing pink elephants being chased on a rollercoaster by planet sized mosquitoes… and discover that waking is even weirder. Welcome to CES. Ok, maybe not quite weirder, but my god, does the world need 1001 makers of iPhone cases and headphones? That’s innovation? I know those kids in those iPod commercials looked cool and all, but really? 1001 companies? And why did the Postal Service have a booth with Elvis and Marilyn Monroe impersonators? Not to mention the man sized Qbert looking things standing around a table sized Surface device playing a kids game. And then there was the keynote. Fear and Loathing in Vegas indeed. No acid needed. When they say ‘consumer electronics’, they mean it. It’s not just TVs, it’s every last little doodad that can be plugged into a wall. And in fact, there were many innovative items floating around, but my main interest was video related stuff, so I’ll chat about that. Although, the Audi booth was a photographers dream. Basically you were inside a giant softbox with a bunch of great cars. Very cool if you wanted to work on your car photography. I still don’t think the TV manufacturers get it. Panasonic and Samsung sort of did. LG and Sharp not so much, and Toshiba didn’t even have someone that spoke english. The Panasonic and Samsung second screen and internet TV offerings were pretty well thought out as a way to control the TV and content. However, you get the feeling that Apple is going to roll into this space and change the way we think about what a TV will do, in the same way they changed what we thought a phone could do. The current offerings just seem lackluster, with the internet tacked on. Not actually rethinking what you can do with a big internet connected screen. 3D was mostly dead. 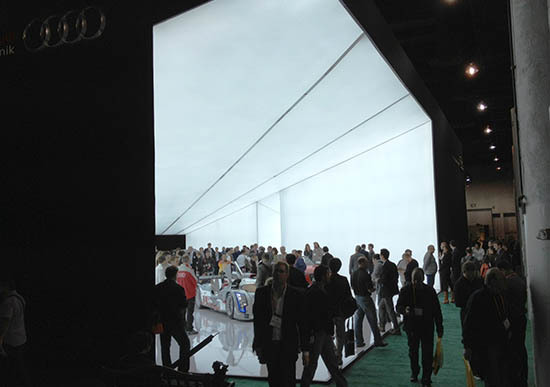 Only LG had a 3D showing… a giant 30 ft wide/12 ft high screen showing headache inducing 3D graphics. Like 3D TV overall, it was a Fail. Good riddance. UltraHD (4K) is officially here. From the content I saw I have a hard time believing it will get the response HD did. SD compared to HD was night and day. UltraHD is better, but not so much better that it’s a nobrain upgrade. I guess we’ll see. The manufacturers have given up on 3D, so UltraHD is the new 3D. A few camera vendors announced cameras that could use apps. Samsung will use Android and Sony, of course, will use their own operating system. Sony _could_ do what Amazon does and tweak their own version of Android and create their own store. But, no, they’re going to roll their own and have 6 people develop apps for it. And yes, they’ll be releasing training videos for this new Sony OS on Betamax. Didn’t Sony lose like a trillion dollars last year? No idea why. And really, the keynote was f’ing bizarre.